Peer review assignments allow other students in the course to read and review a given student's file or essay submission. You can grade both reviews and submissions, and a student's assignment grade can be based not just on the quality of their submission, but also that of their interaction with other students' work. Peer review activity can also be used as criteria to suggest an overall assignment grade. Submissions are the essay or file that a student submits for evaluation. 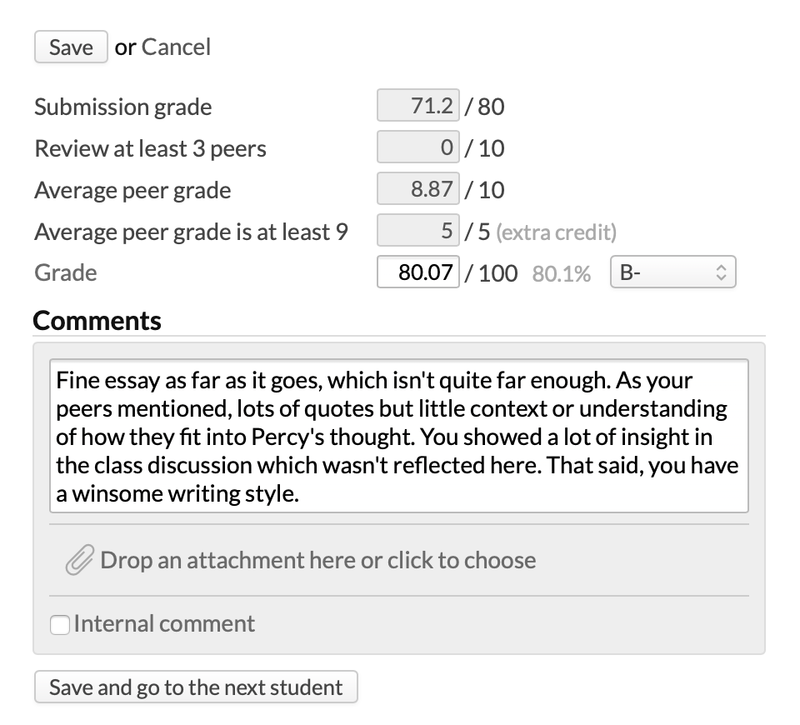 Reviews are the commentary (and grade) a student leaves on his peers' submissions. The assignment as a whole is worth a certain number of points, just like any other assignment. Submissions and reviews can be awarded grade points (in assignment settings); these are wholly independent of the overall assignment points. In the assignment's grading criteria, the submission and review grades can be awarded a portion of the assignment points. The student's performance on the individual criteria is then used to suggest an overall assignment grade. You set up the peer review assignment, selecting assignment options and grading criteria to structure how students interact with one anothers' work. A student uploads a file or composes an essay. As soon as he submits it, you and the other students can begin reviewing it. The other students submit reviews of the student's work. You read the submissions and reviews, grading them as appropriate. Populi keeps track of each student's activity (Did he submit the essay? Did he review others' work? Was it on time? etc.). When it comes time to enter grades, you'll see a summary of the grading criteria and how each student performed. The criteria are used to suggest an assignment grade. When creating the assignment, make sure to choose either Peer review file or Peer review essay as the assignment type. 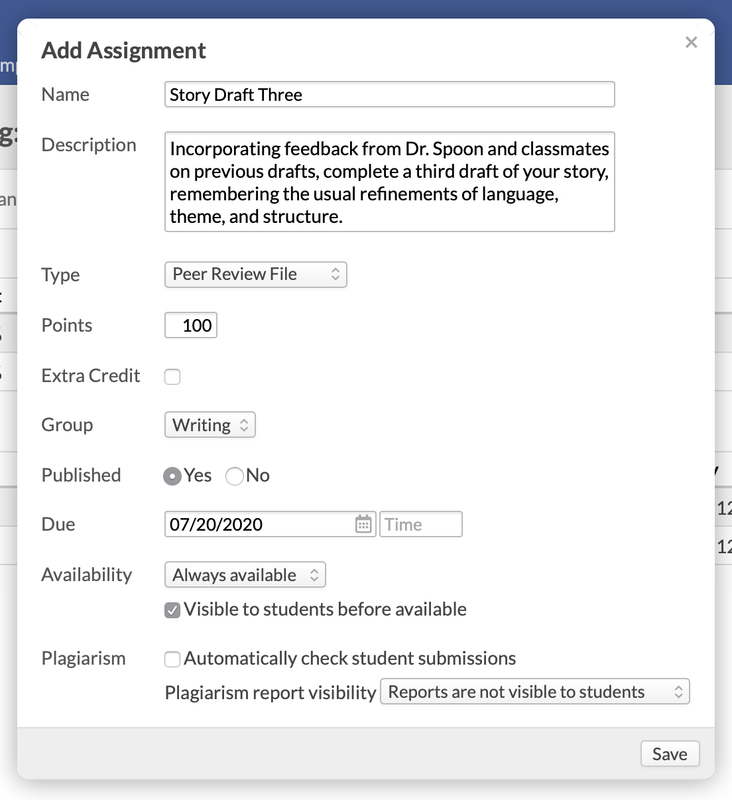 You'll set up the assignment settings and grading criteria on the assignment's page. Peer grade: Check to allow students who review others' work to leave a grade as part of their review. The peer grade will be used to suggest the grade for a student's submission. If you check this option, make sure to enter something in Grade Submissions! Grade submissions: Enter the total number of points a student can earn on his submission—remember, this number is independent of the total assignment points. If you've checked to allow Peer grades, students will mark each other's submissions according to the points entered here. Peer grades will not push to the gradebook—you must still grade the assignment! Grade reviews: Enter the total number of points a student can earn on his reviews. Only the course faculty and teaching assistant can grade reviews. Anonymous reviews: Check to hide who wrote submissions and reviews from students. Review visibility: Choose whether/how you wish to make peer reviews visible to other students. 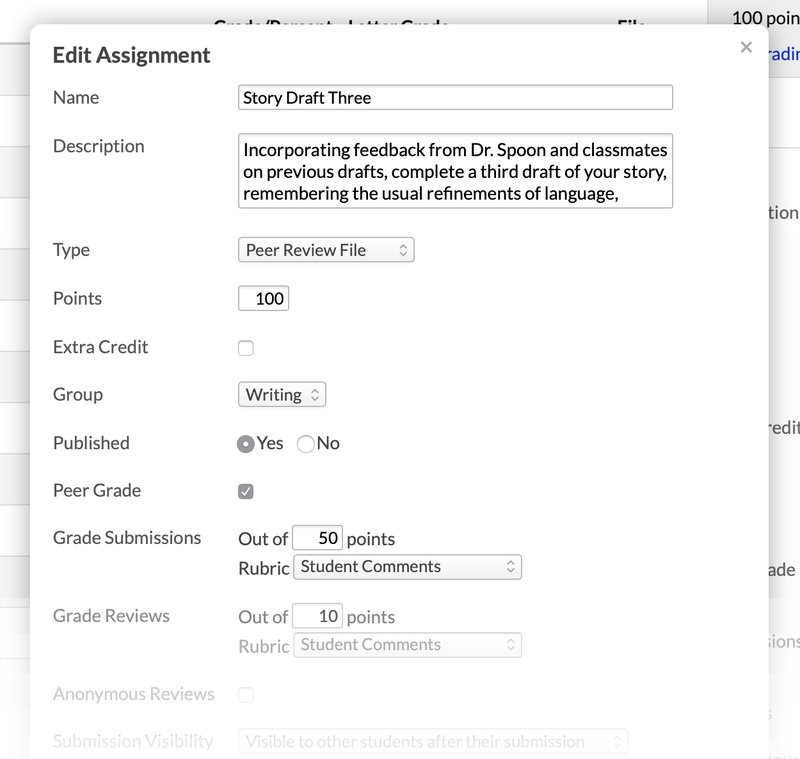 You'll also have the option to allow students to comment on other students' reviews. Submissions due: Pick a date/time by which you require student submissions. This is independent of the assignment due date. Reviews due/closed: Pick a date/time by which peer reviews of student submissions are due or closed. After reviews are closed, students can no longer review other students' work. All of these settings are optional! Grading criteria establish how a student's submission and review activity will be used to suggest an assignment grade. Select an option from the drop-downs (see below). Enter the number of points the option is worth. The points here are assignment points. Check the counter at the bottom to see how many of the assignment points are connected to the options you've chosen. Check to mark an option as extra credit or partial credit. Some options are automatically marked as partial credit. Click add to add more options. Your grading criteria options depend on which settings you've chosen. Submission grade: How do you wish the points awarded to the submission by you to count to the overall assignment grade? This option is automatically partial credit. Number of reviews is at least: How many other submissions must a student review? If you enter 3, then each student must review the submissions of three other students in order to get those assignment points. Average peer grade/is at least: If you enable peer-grading, how do you wish the grades given by peers to the student's submisson to figure into the overall assignment grade? Average review grade/is at least: If you grade student reviews, how do you wish for those grades to count in the assignment grade? After getting your assignment, settings, and criteria set up, it's ready for students to begin interacting with it. You'll start on the assignment page, which you can get to via the assignments view or a course alert. Blue dots indicate there is unread activity on that student's assignment detail page; green dots indicate that all activity has been read by you. A check mark indicates that the student has submitted an essay or file for the assignment. Click enter grades to grade all the students' assignments. Click download assignment files to download a .zip folder of all the files that have been uploaded to this assignment. 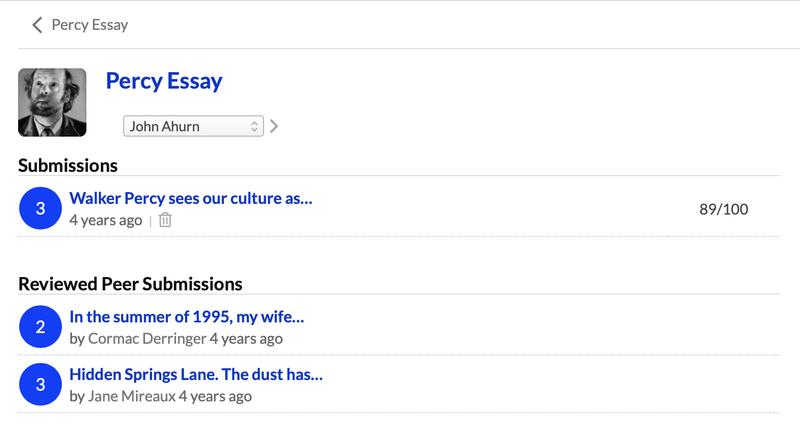 On the assignment detail page, you can review the student's activity, including his submissions and reviews. Click any of the submission sluglines to see the peer review page, which includes the submission and any reviews. On the Feedback view, you can read the student's submission and directly interact with him about his work. Here you'll see the submission and reviews, as well as enter grades for each (if so enabled). Use the document viewer to leave annotations for the student's benefit. 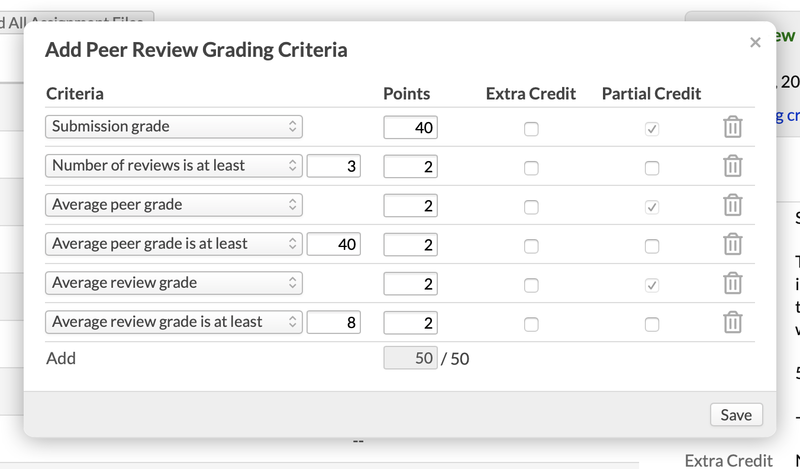 Depending on your assignment settings, click enter grade next to a submission or review to grade it. 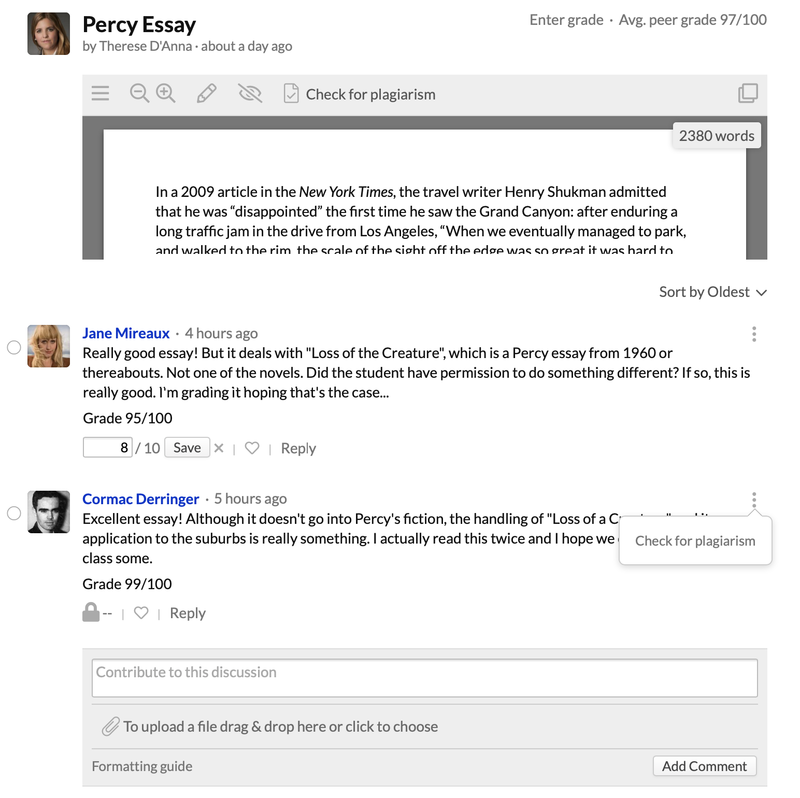 You can sort peer reviews (just like you can with discussion activity). Jump to another student using the drop-down selector at the top of the screen or navigate back and forth using the arrows. 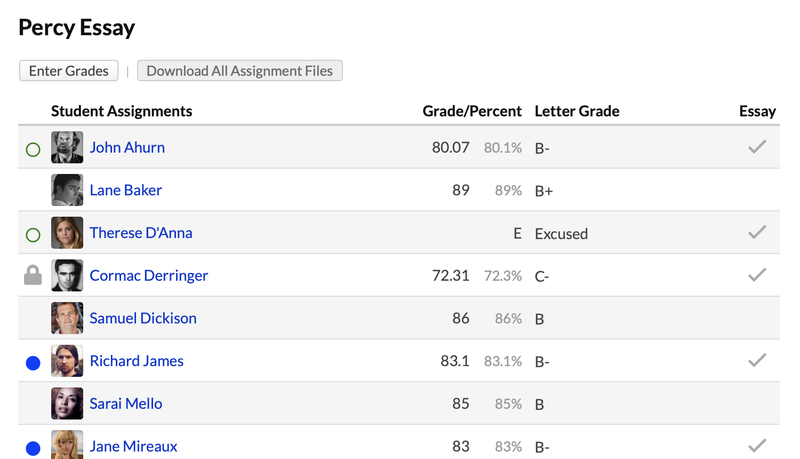 When you're ready to grade a student, click Enter Grades on the assignment detail page or the peer review page. The student's scores for each of the grading criteria have been calculated by Populi. These scores are used to tally a suggested grade for the assignment. You're free to keep the suggestion or edit the grade. Leave the student feedback, if desired. When you're done, you can simply Save or Save and go to the next student.